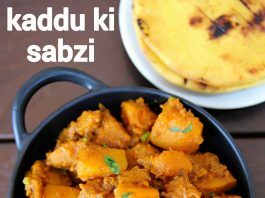 kaddu ki sabji recipe | kaddu ki sabzi | pethe ki sabji | pumpkin sabzi with detailed photo and video recipe. 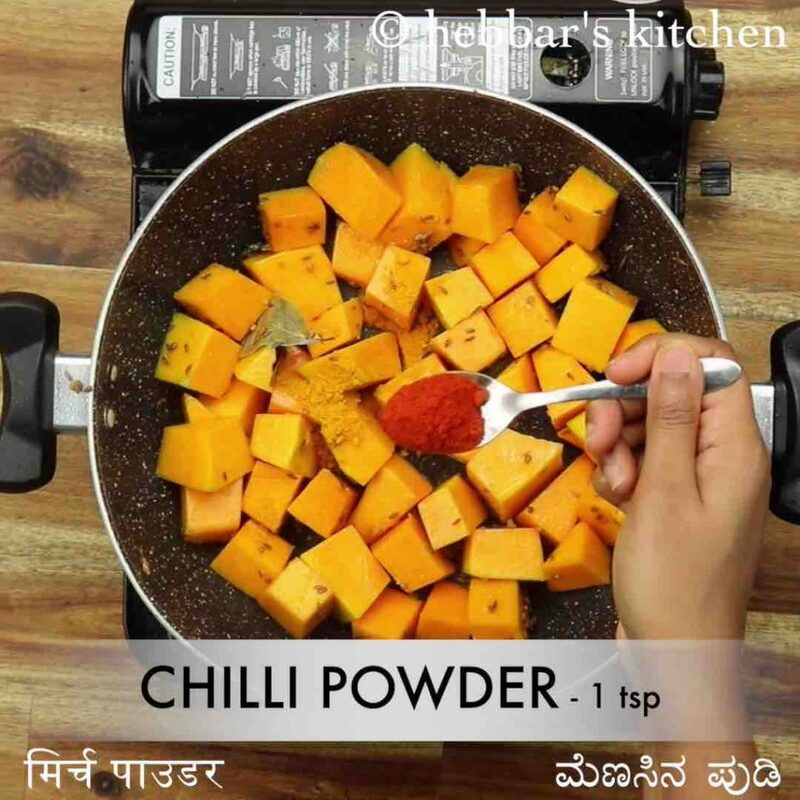 a simple and easy day to day dry curry recipe made with sweet pumpkin slices. it is perhaps one of the most frequently made north indian curry in many indian households for day to day lunch and dinner. it is typically served as side dish to chapati or roti, but also tastes amazing with naan and even choice of rice and dal combo. 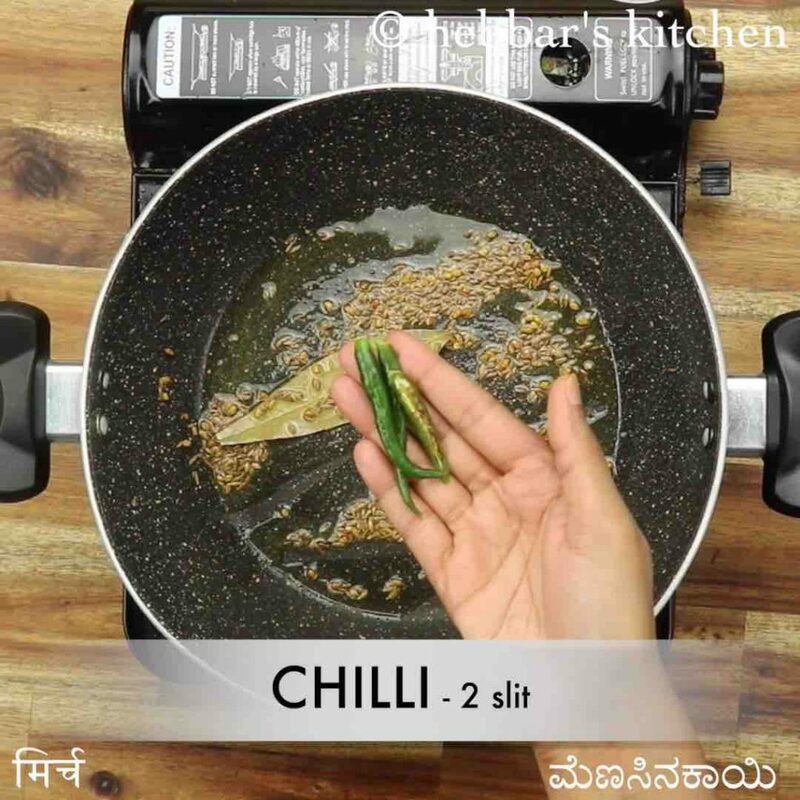 kaddu ki sabji recipe | kaddu ki sabzi | pethe ki sabji | pumpkin sabzi with step by step photo and video recipe. north indian curry is an essential dish for many indians. it is a purpose based dish which is either served as a side dish with indian flatbread or perhaps with rice and dal combo. 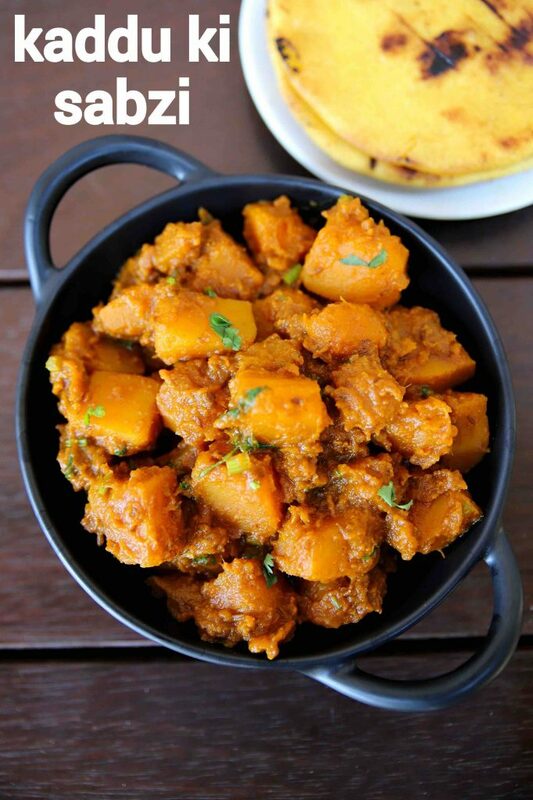 one such underrated dry indian curry recipe made with sweet pumpkin recipe is kaddu ki sabji ideal for various occasions. as i previously mentioned, kaddu ki sabzi recipe is perhaps one of most underrated and also less accepted dry sabzi. in other words, when it is on a direct contest with paneer or even with potatoes, kaddu ki sabji takes always less preference. it is very much like electricity, we do not appreciate it when is up and running and the only crib when it is not working. jokes apart, the pumpkin recipe deserves a lot more respect and appreciation from us. it is so simple and quick to make and is more often made when we do not wish to make something fancy or require something very quickly. i personally make this as a multipurpose dish. in my house, it is served as a side dish to chapati, or dal rice combo and also used as stuffing for a sandwich. well, it is up to your preference and can choose it accordingly. furthermore, i would like to conclude with some tips, suggestions and variations for kaddu ki sabji recipe. firstly, while selecting the pumpkin from the store, i would heavily suggest getting a fresh and yellow coloured one. 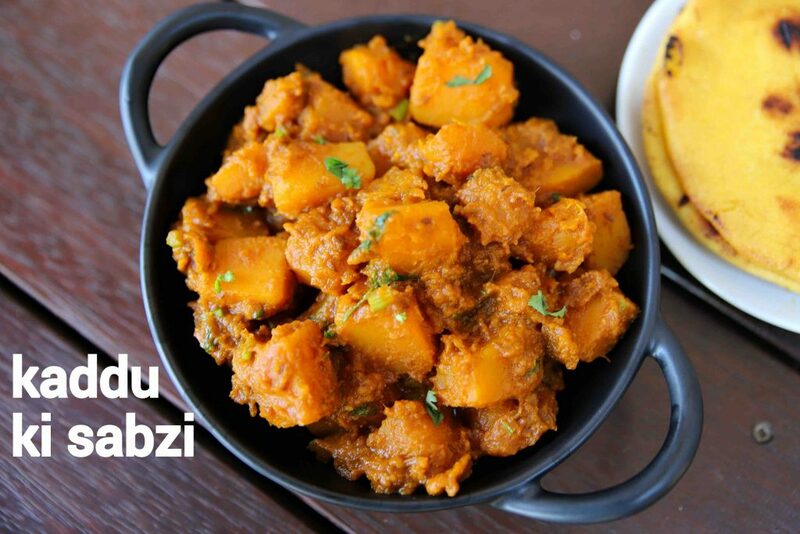 it would deliver a perfect combination of sweet, spicy and savoury dry sabzi. secondly, i have made this recipe as a dry curry with less gravy sauce in it. but this can also be made as gravy based curry with onion and tomato-based sauce. 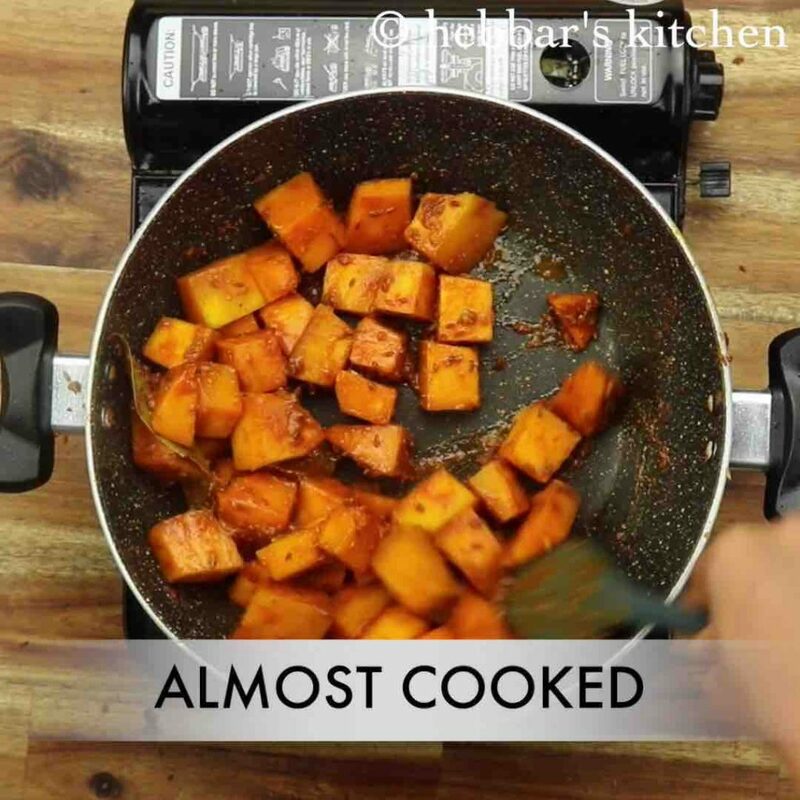 lastly, do not overcook the pumpkin and it has to hold its shape after the recipe is cooked. firstly, in a large kadai heat 4 tsp oil and saute spices. also, saute 2 chilli and 1 tsp ginger paste until it turns aromatic. 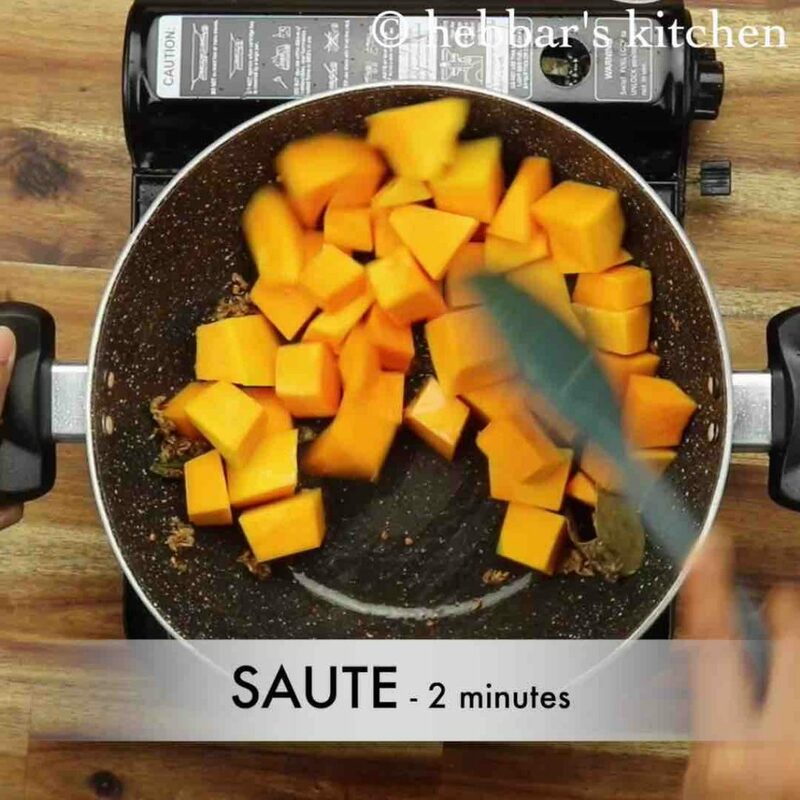 further, add 600 grams pumpkin and saute for 2 minutes. 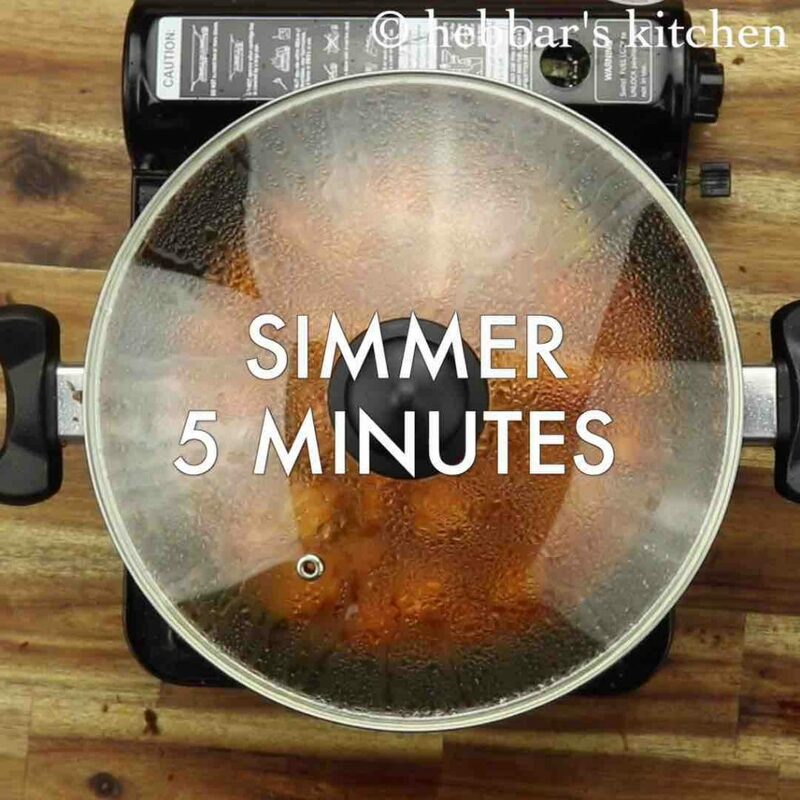 additionally, add spice powder and ¾ tsp salt. saute for 2 minutes until the spices are well combined. add ¼ cup water, cover and cook for 10 minutes stirring in between. cook until the pumpkin is cooked well. 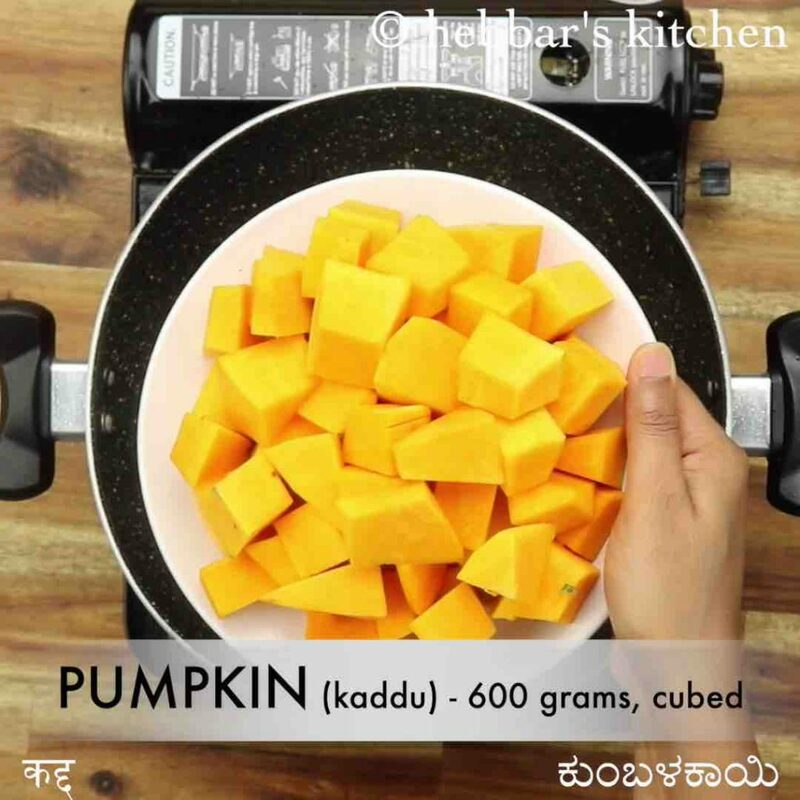 now add 1 tsp jaggery, 1 tsp aamchur and ¼ cup water.mix well and cook until the pumpkin absorbs all the flavour. finally, add coriander and enjoy kaddu ki sabzi with roti. 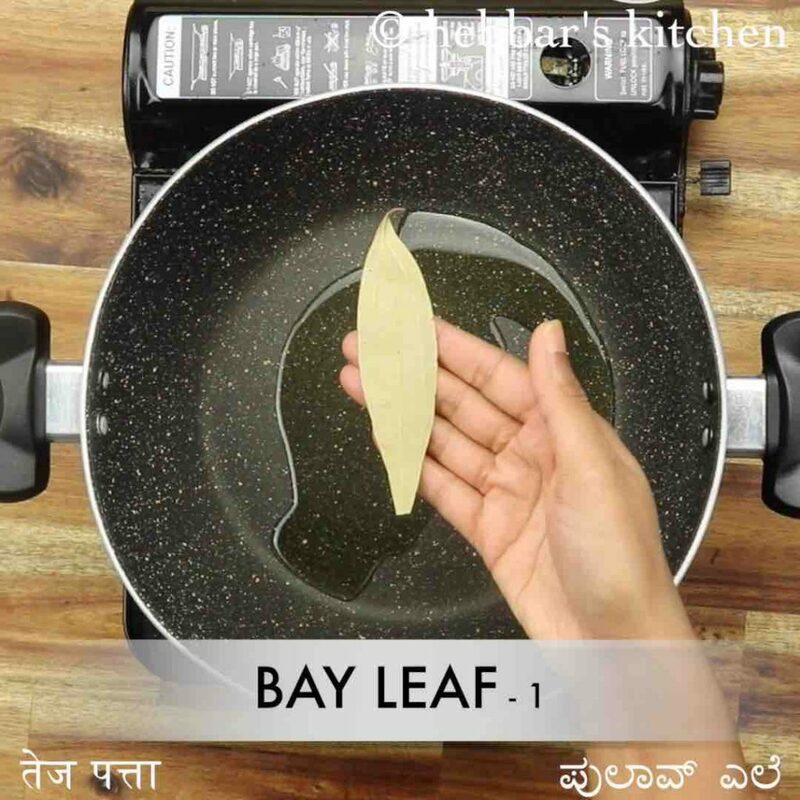 firstly, in a large kadai heat 4 tsp oil and saute 1 bay leaf, 1 tsp cumin, ¼ tsp methi and pinch hing. further, add 600 grams pumpkin. make sure peel the skin and cut into cubes. saute for 2 minutes until the oil is coated well. 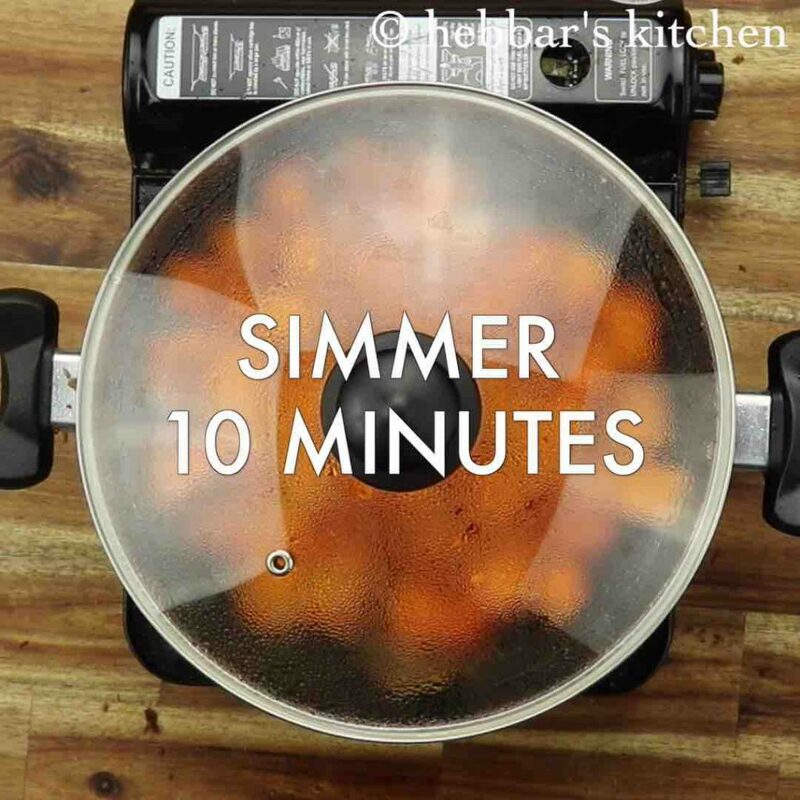 additionally, add ¼ tsp turmeric, 1 tsp chilli powder, ½ tsp coriander powder, ½ tsp garam masala and ¾ tsp salt. 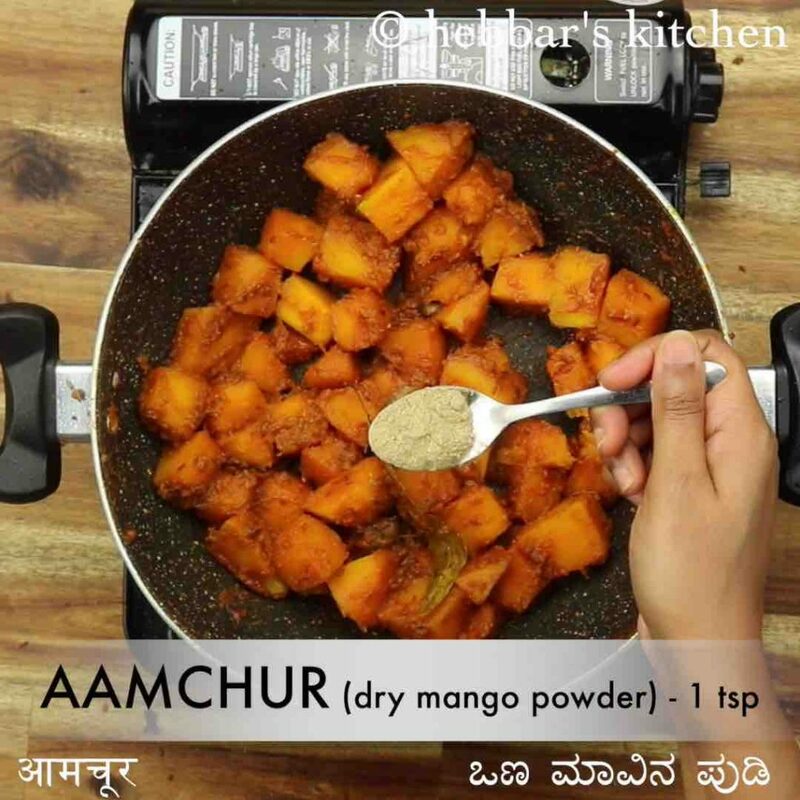 now add 1 tsp jaggery, 1 tsp aamchur and ¼ cup water. 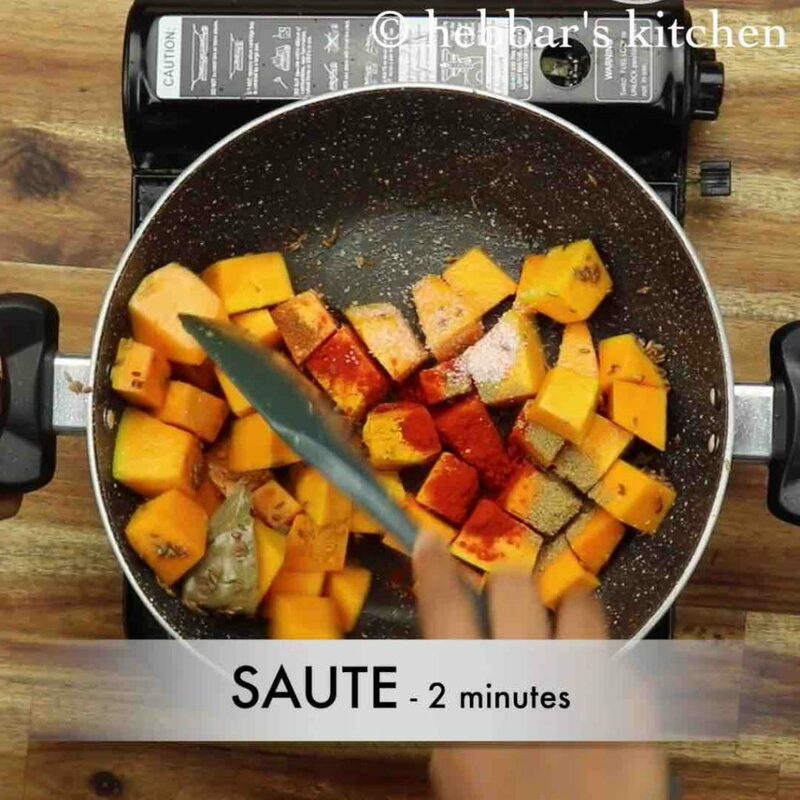 mix well and cook until the pumpkin absorbs all the flavour. firstly, mash few pumpkin to get a gravy consistency. also, if you are looking for bhandare wali style then mash of kaddu after cooking adjusting consistency as required. additionally, this is no onion – no garlic recipe. however, you can add if you wish. finally, kaddu ki sabzi recipe tastes great when prepared spicy, sweet and tangy.